"Air spray" redirects here. For the North American airline, see Air Spray. Gas duster, also known as canned air, is a product used for cleaning or dusting electronic equipment and other sensitive devices that cannot be cleaned using water. The products are most often a can that, when a trigger is pressed, blasts a stream of compressed gas through a nozzle. Despite the name "canned air", the cans actually contain gases that are compressable into liquids. True liquid air is not practical, as it cannot be stored in metal spray cans due to extreme pressure and temperature requirements. Common duster gases are 1,1-difluoroethane, 1,1,1-trifluoroethane, or 1,1,1,2-tetrafluoroethane. Hydrocarbons, like butane, were often used in the past, but their flammable nature forced manufacturers to use fluorocarbons. Canned air can be used for cleaning dust off surfaces such as keyboards, as well as sensitive electronics in which moisture is not desired. When using canned air, it is recommended to not hold the can upside down, as this can result in spraying liquid on to the surface. The liquid, when released from the can, boils at a very low temperature, rapidly cooling any surface it touches. This can cause mild to moderate frostbite on contact with skin, especially if the can is held upside down. Also, the can gets very cold during extended use; holding the can itself can result in cold burns. A dust spray can often be used as a freeze spray. Many gas dusters contain HFC-134a (tetrafluoroethane), which is widely used as a propellant and refrigerant. HFC-134a sold for those purposes is often sold at a higher price, which has led to the practice of using gas dusters as a less expensive source of HFCs for those purposes. Adapters have been built for such purposes, though in most cases, use of such adapters will void the warranty on the equipment they are used with. One example of this practice is the case of airsoft gas guns, which use HFC-134a as the compressed gas. Several vendors sell "duster adapters" for use with airsoft guns, though it is necessary to add a lubricant when using gas dusters to power airsoft guns. 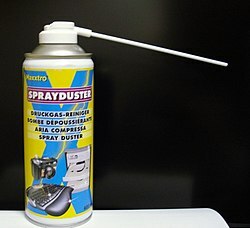 Since gas dusters are one of the many inhalants that can be easily abused, many manufacturers have added a bittering agent to deter people from inhaling the product. Because of the generic name "canned air", it is mistakenly believed that the can only contains normal air or contains a less harmful substance (such as nitrous oxide, for example). However, the gases actually used are denser than air, such as difluoroethane. When inhaled, the gas displaces the oxygen in the lungs and removes carbon dioxide from the blood causing the user to suffer from hypoxia which results in the euphoric feeling abusers desire. This type of inhalant abuse can cause a plethora of negative effects including brain and nerve damage, paralysis, serious injury, or death. Since gas dusters are often contained in pressure vessels, they are considered explosively volatile. Ozone layer depletion: Gas dusters sold in many countries are ozone safe as they use "zero ODP" (zero ozone depletion potential) gases; tetrafluoroethane, for example, has insignificant ODP. This is a separate issue from the global warming concern. True "air dusters" using ordinary air are also available in the market. These typically have much shorter run times than a chemical duster, but are readily refillable. Both hand pump and electric compressor models have been marketed. The maximum pressure for an aerosol can is typically 10 bar (145 psi) at 20 C (68 F). Therefore, a fully compressed air duster will exhaust air about 10 times the can volume. Recently electronic versions which only use air have become viable alternatives that are preferred by many large corporations due to the fact that they contain no hazardous chemicals, are safe for the environment, do not freeze and they cannot be abused. The leading plug-in alternatives are made by ITDusters, DataVac and Airrow and the leading cordless alternative is made by Canless Air System. Another mechanical alternative is a camera air blower. ^ Melissa Conrad Stöppler, MD. "Huffing (Inhalant Abuse) Symptoms, Signs, Abuse Information - MedicineNet". MedicineNet. ^ "What causes compressed air (from "Dust Off" cans) to freeze, but only when turned upside down?". ^ snopes (4 March 2016). "Dust Off Death : snopes.com". snopes. ^ "Changes in Atmospheric Constituents and in Radiative Forcing" (PDF). Cambridge University Press. 2007. p. 212. Retrieved 11 May 2017. ^ Catalytic Air Pollution Control: Commercial Technology – Ronald M. Heck, Robert J. Farrauto, Suresh T. Gulati – Google Books. Books.google.com. 2009-02-24. Retrieved 2012-11-13. ^ "Aerosol Explosion Investigation and Accident Reconstruction at CHEMAXX.COM". This page was last edited on 17 March 2019, at 17:53 (UTC).